New era: Graduating students with Australian Catholic University Emeritus Professor Brother Tony d’Arbon, and, above left, the celebrations of the day. 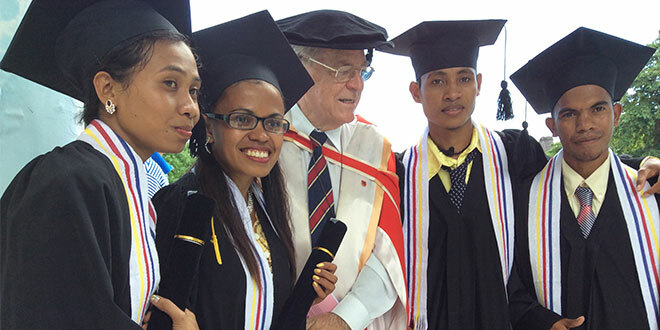 TIMOR Leste has reached an education milestone with the latest graduation of 46 teachers from a college run by the Marist Brothers Province of Australia. More than 500 teacher graduates have passed through the Instituto Catolico para a Formacao de Professores, since the college was built soon after Timor Leste (East Timor) gained independence from Indonesia. This is no small feat in a country devastated by fighting, turmoil and the destruction of almost all major buildings at the end of Indonesia’s 25-year rule. Education all but disappeared during the upheaval after the Timorese voted in a popular referendum for independence on August 30, 1999. Schools were unroofed then burnt down and the majority of teachers, who were Indonesian, fled to escape the turmoil. In 1999, in the wake of the turmoil, the Bishop of Baucau, Basilio do Nascimento, wrote to the Marist Brothers in Melbourne requesting urgent help to start training new teachers for a new country. The Marist Brothers initially provided professional development for teachers and directors of schools throughout the districts. In 2003, the ICFP teachers college officially opened its doors to start training 53 primary school teachers. The first cohort of qualified teachers graduated in 2006. Ten years later, the 2016 graduation of 46 teachers has lifted the number of ICFP graduates to more than 500. At the graduation ceremony, in front of a large crowd in the central marketplace in Old Town Baucau, ICFP director Brother Peter Corr congratulated graduating students for their achievement, in a country where suitably qualified teachers were in desperately short supply. “You have studied for three years to become good teachers who help your students of the future to become good students, who love learning,” Br Corr said. “In this way, you also help develop this nation and bring more hope to its future. ACU Emeritus Professor Brother Tony d’Arbon attended and awarded three ICFP staff members masters degrees in education.